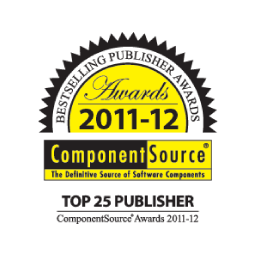 ORPALIS is pleased to appear in the Top 25 Bestselling Publisher and Product lists edited by ComponentSource, one of the leaders of software development resources in the world. For the third year in a row ORPALIS and its flagship product GdPicture.NET have won awards. ORPALIS ranked 20-th in Top 25 Best-selling Publisher 2011-2012, up from 30-th place last year, in ComponentSource overall publisher list. GdPicture.NET SDK ranked 24-th in Top 25 Best-selling Products for 2011-2012, up from 48-th place last year in ComponentSource overall best-selling products list. Muret, France, May 21, 2012. ORPALIS, creator, developer and owner of the comprehensive document imaging toolkit series released under the brand “GdPicture” ranked 20-th in Top 25 Best-selling Publisher 2011-2012, up from 30-th place last year, in ComponentSource overall publisher list. GdPicture.NET SDK ranked 24-th in Top 25 Best-selling Products for 2011-2012, up from 48-th place last year in ComponentSource overall products list. ComponentSource grants their awards on real sales orders placed by their customers globally during 2011. GdPicture.NET includes all needed features for developers to enjoy complete power and control over document handling in the domains of image processing, document-imaging and document-management. It is delivered under 7 different editions (Document Imaging SDK Ultimate, Document Imaging SDK, Image SDK, TWAIN SDK, TWAIN PRO SDK, Document Viewer SDK and Partners Editions) which are completed by 8 additional plugins (1D, Datamatrix and QR-Code Barcode Recognition, PDF, Annotations, Tesseract, OMR and JBIG2 Plugins). The version 8 of GdPicture.NET has been released in June 2011 and has become a worldwide bestseller since. In their reviews, customers acknowledge GdPicture.NET SDKs as “very powerful” and “easy to manipulate”.